This pattern has been retired along with it's video tutorial. Feel free to use the pattern below but keep in mind that retired patterns will not receive pattern support. The pattern below remains protected under copyright. Read me ~> Work in continuous rounds, do not join. 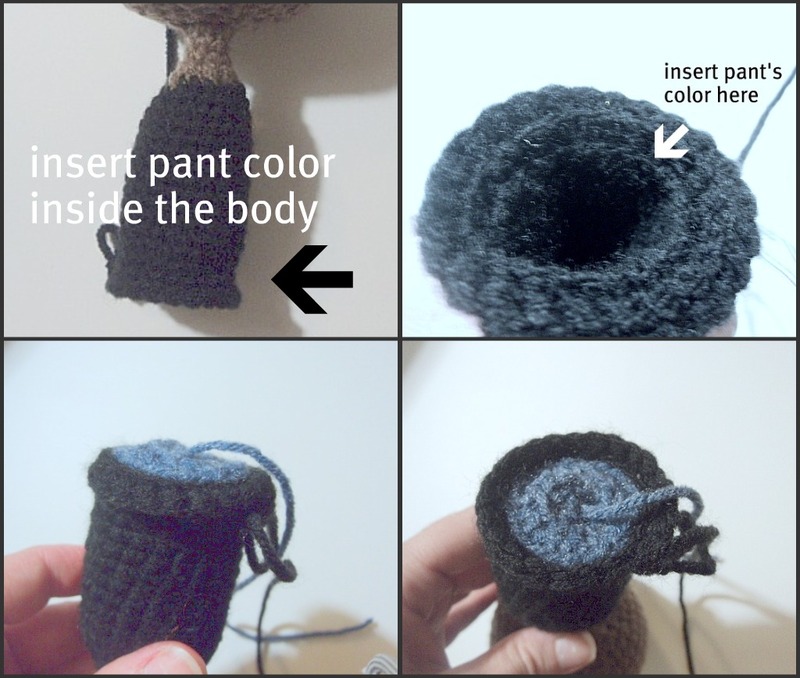 I used Red Heart Super Saver and also Red Heart Comfort yarn with a 3.75 mm hook. 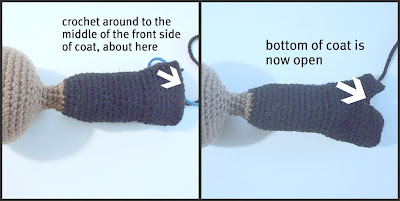 ** Stuff the neck and the upper part of the body firmly, shape as you stuff. 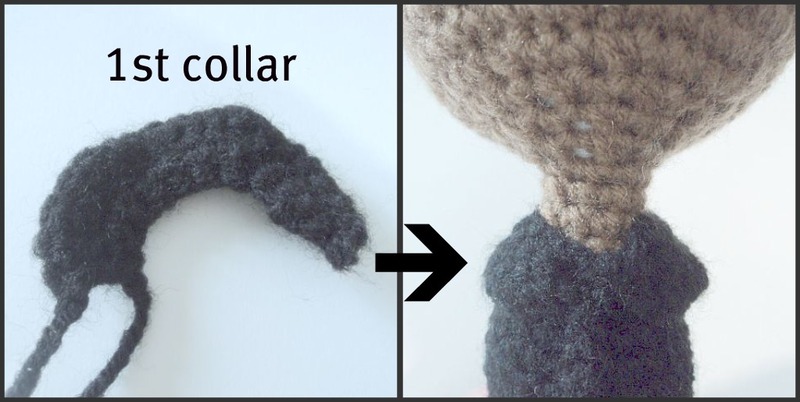 For the collar you need to make 2 separate pieces. 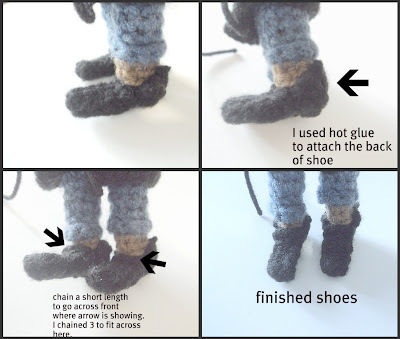 There are 2 ways you can do the legs, one is to have a little bit of the legs showing at the bottom of pants as pictured or choose to just do the pants to the shoes. The choice is yours. The pattern for the legs below is for a little bit of the leg showing... if you don't want that then skip the front loop part and stitch in both loops near the bottom of the leg. DO NOT STUFF. 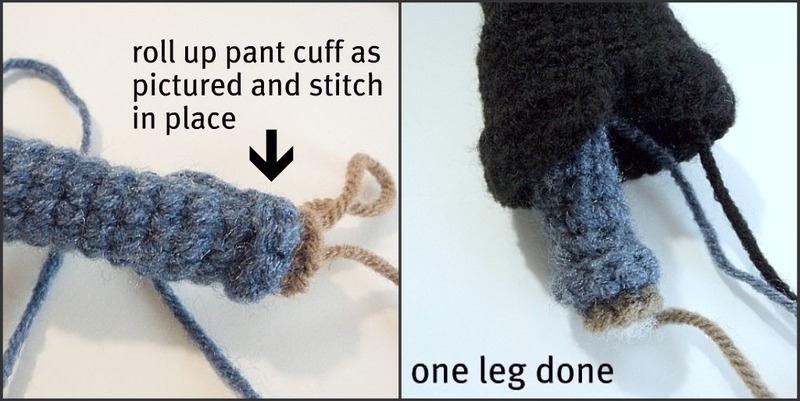 Sew 2 together and sew to bottom of leg as pictured below. The shoes look just fine as they are now but I wanted to add the heel which then required me to make the back piece. Heel) Ch 7 and 1sc in each ch across starting from the 2nd ch from hook. Finish off. 16+) this is where you go on and make fingers. Make the fingers any length you choose. If you chose not to make fingers you can make the simpler round hand: 1sc then 2tog until you close the gap. Add a thumb if you want to! Now I like to root the hair into my dolls. Wybie has crazy hair. You need to root the hair as pictured below then brush, brush and brush, brush, and brush, brush some more until you have all the strands frizzed completely out. 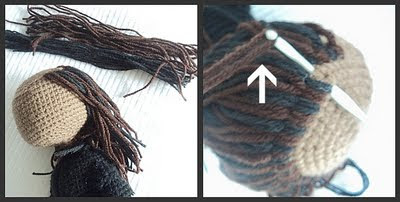 Use a wire brush for the best results. Remember this will take some time! Ok, so for the eyes and mouth, nose and so on, it is all up to the creator. I chose buttons because they look great I think! 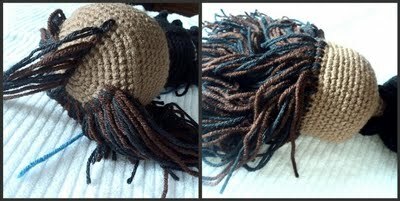 The nose is created by inserting a length of yarn through the back of the head and out through where the nose will be. 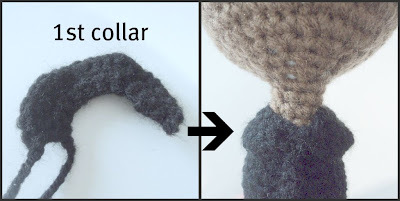 Use a needle and crochet hook to build and shape the nose. 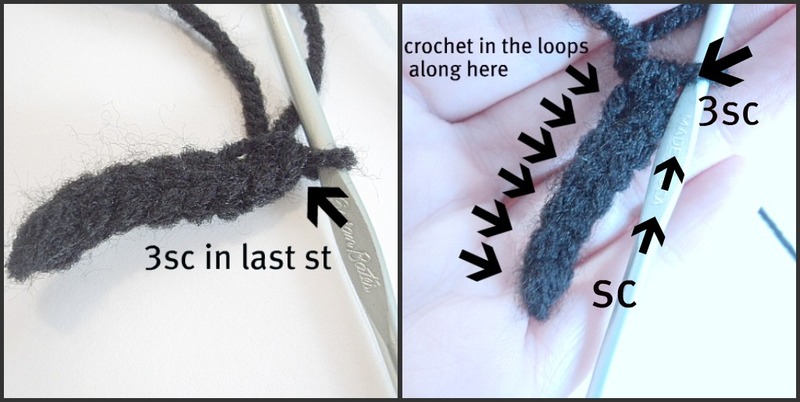 Once you've finished run the tail of the yarn back out through the back of the head and knot off. Hide in the hair. The same goes for the eyebrows and the mouth. So now we're finished and you have your own Wybie doll! Thank you Jen O! I'm sure if you tried you would be able to crochet... make it a resolution for 2012! FANTASTIC!!! 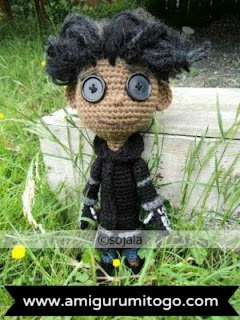 !We are fans of Coraline here. I hope you manage some more of the characters. I'd love to make them all. Well done!!! Awww, thanks so much Deanne :) I am planning more of the characters. Hopefully soon I'll get the time I need to do so. You are EXTREMELY talented!! Your creativity is amazing!! These dolls are a departure from the traditional and what has been done before...and they are FANTASTIC!! 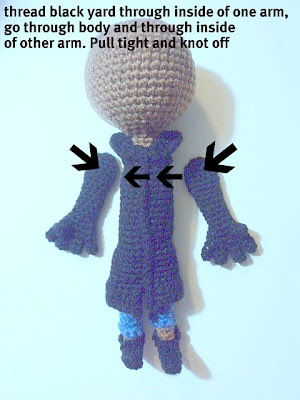 You could make a nice living creating dolls like this and selling them...they are unique and so fricking cool!! 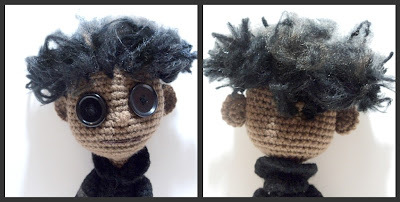 I thank you so much for sharing the pattern and your take on amigurumi dolls...I am certain that your style will flourish. Thank you so very much Kaybee! I appreciate your kind feedback. 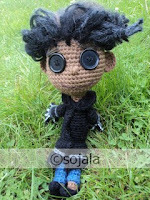 It's always so exciting to have people interested in my dolls. 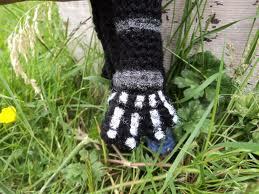 I hope to one day have the time to make more and sell in a shop.. it's on the back burner. But for now I really enjoy the blog and sharing the patterns I've come up with. I am a huge Coraline fan as I'm sure you figured out, lol. I hope to come up with more of the Coraline characters soon! I need more hours in my day!!! 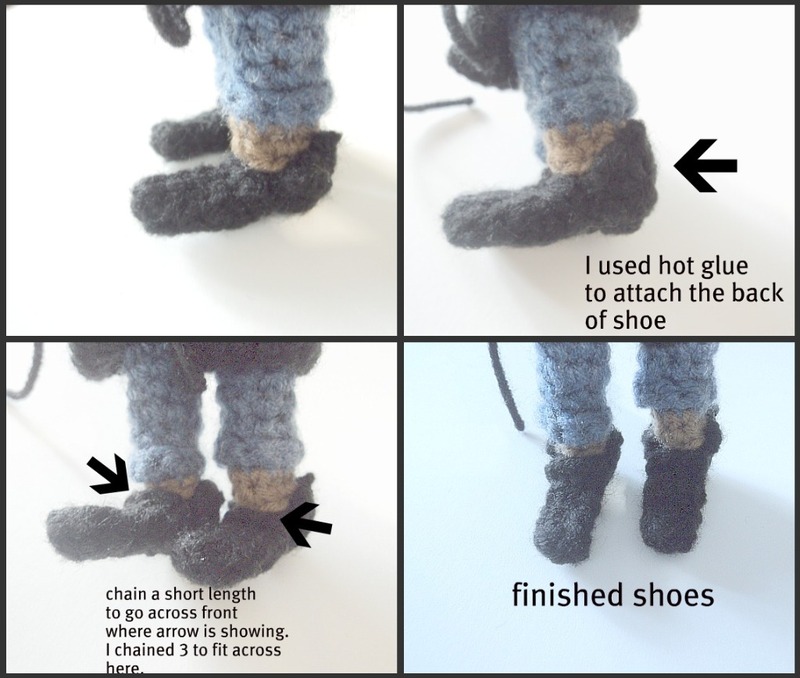 Brilliant doll and your instructions are excellent. Very cool. 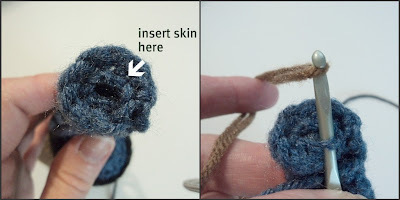 Thank you very much for these explanations, you are doing such a good job, I was looking for a video on how to crochet a hat and saw the Wybie character you did I didn't know that you could make these things for a crochet !!! Keep up the good & great job you doing and keep inspiring us .